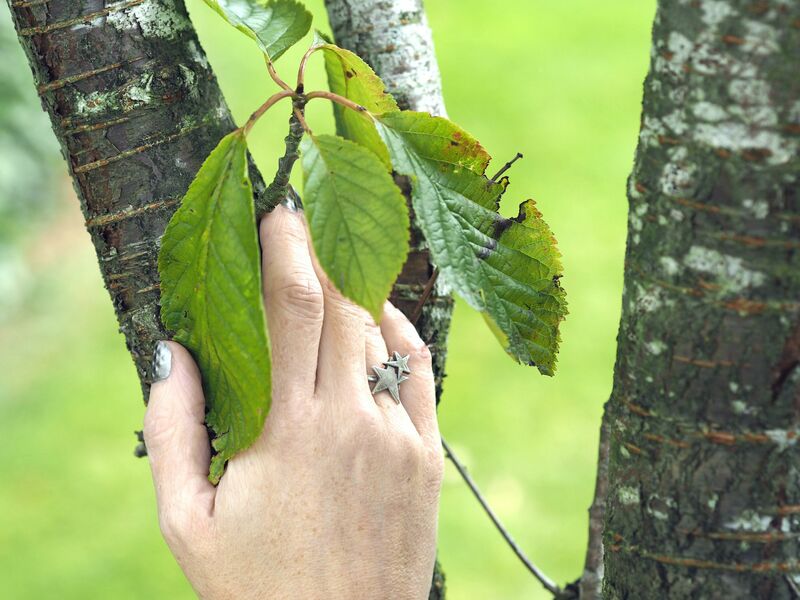 The dip in temperature over the last week has left me in little doubt that autumn is upon us. But I love autumn. I always have done. I’ve mentioned before that my birthday’s in October and for me that signifies the start of the sparkliest time of year. Not only that, I adore the textures and rich colours that go hand in hand with the clothing of the season. With crisp, bright mornings and cosy evenings, this all serves to appeal to my sensuous nature. Certain colours such as khaki and plum typify the season. I can’t imagine wearing them in high summer for example, because that’s when whites, brights and pastels come into play. Metallics, navy, black and greys are the mainstays of my winter wardrobe. Autumnal colours are mellow, warm and subtle. They’re the calm before the storm of fireworks and fairy lights and we all need a little calm sometimes. Ian and I had a night away in Worcester last weekend, a short break that included a treatment at the hotel’s spa. It was a much-appreciated chance to spend some time alone and to relax. (It didn’t quite turn out as we’d hoped, but more of that in the next post). The hotel grounds were beautiful though and is where we took these photographs. I love dresses as you know. 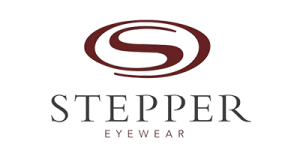 I wear them as much during the cooler months as I do throughout spring and summer. Transitional dressing can be tricky though, so I find an easily removable layer works in most instances. Ankle boots or brogues are my autumn staples and both work well with sheer tights. Later in the season, knee-high boots and thicker tights can take their place. 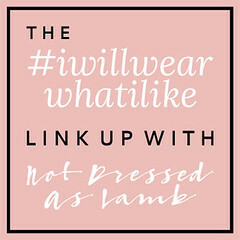 Tunic dresses like these are easy to wear due to the unstructured shape, yet they still fall into the smart casual category. They’re ideal for travelling in too. The journey to Worcester took over three hours. I was driving, so wanted to be comfortable, unrestricted and smart enough to head straight for lunch on arrival. This tunic dress ticked all of those boxes. It has a contrast jersey lining and simply slips on, so there are no zips or buttons to contend with. And it has pockets and we all love pockets. It’s from Tulchan, a brand I go to for smart casual clothes that are as happy in town as they are the country. (You might remember the blue cable sweater I wore last spring which is perfect for Sunday brunch, and the pink striped breton that I wore for a weekend away in the Yorkshire Dales). Now you might have noticed that mohair serapes have featured in quite a few of my recent outfits. (With jeans and short wellies, with a smart dress and with coated skinnies on date night). This is because of an ongoing collaboration with the manufacturer, Samuel Tweed. I’ll be writing more about it soon because it’s a local (Yorkshire) brand. Anyway, this serape is the perfect plum shade to pick out the same-colour detail in the dress. 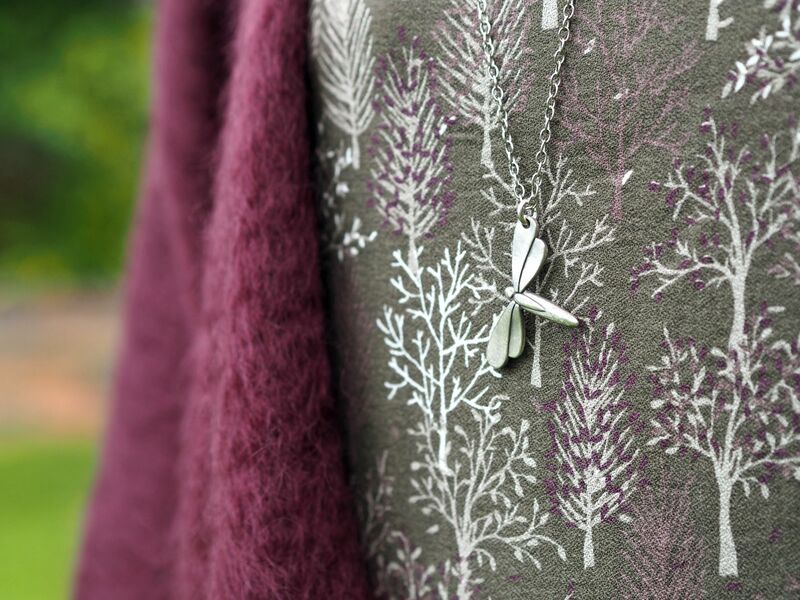 This longline dragonfly pendant is one of my favourite pieces of daytime jewellery. It’s pretty and delicate but has enough about it to get noticed and it draws compliments whenever I wear it. The double stars ring is also a great favourite of mine and is available in gold too. Both have matching items too. 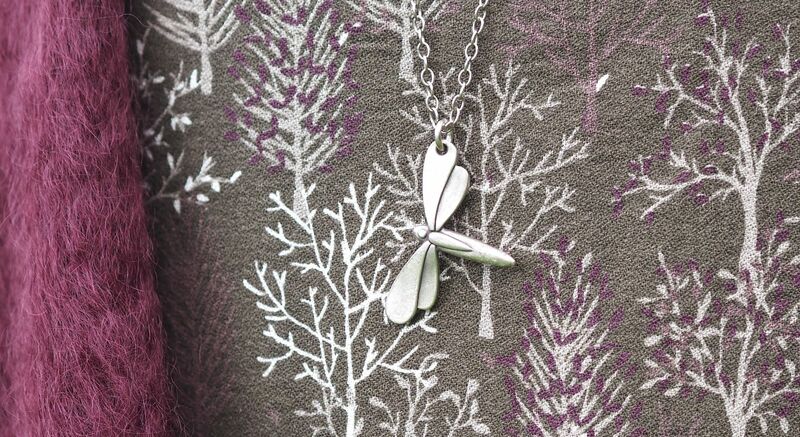 The dragonfly pendant is £39.95 and the ring is £25. Both of them are by Danon, a brand which hand-crafts jewellery in Israel and which I sell in my online accessories boutique, Lizzy O. and like everything else on my website, has free UK delivery. The wrap bracelets are also from my boutique. They’re only £12.50 each and I love mixing and matching the different colours. 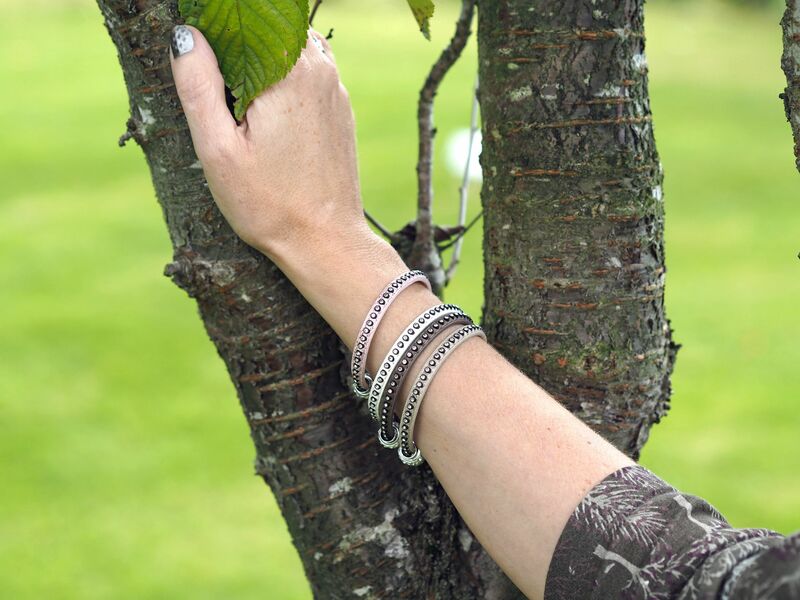 They fasten with a sparkly magnetic clasp and they’re ideal for both day and night. I can’t tell you how grateful I am when you support not only my own business, but those that support my blog too. My dress is a gift from Tulchan and my bag is a gift from House of Fraser. The serape is on loan but I might pretend I’ve lost it so I don’t need to return it 😉 Everything I write is always completely honest and the content is always my own. I wouldn’t wear anything I don’t love, or wouldn’t choose myself. And as I said earlier in the post, make sure you come back on Tuesday to read my very honest review of the hotel in which we stayed. It’s the first time I’ve ever written anything negative in a hotel or restaurant review! I am shocked and appalled that you had such an awful stay at this hotel, the name of which you have published on your Instagram. I was thinking of having my wedding reception there but they have now lost out on my custom! I hope all the staff lose their jobs and they and their offspring are reliant on foodbanks from hereafter. I will look elsewhere! “I hope all the staff lose their jobs and their offspring are reliant on food banks”????? What a very odd and mean thing to wish on anyone. The serape is gorgeous! Wraps and ponchos are so useful at this time of year. 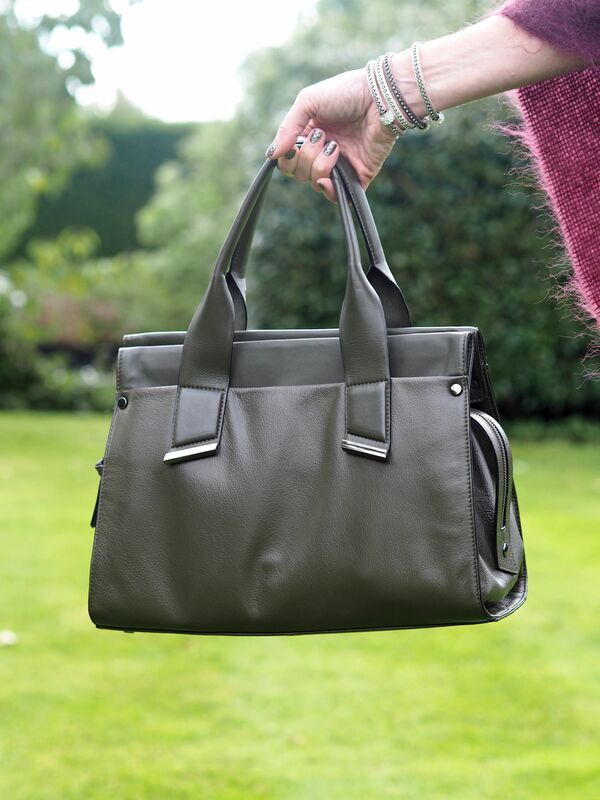 Khaki is a great choice for a handbag. I’ve never considered it before but your H of F bag is beautiful. You look absolutely stunning, Lizzy! 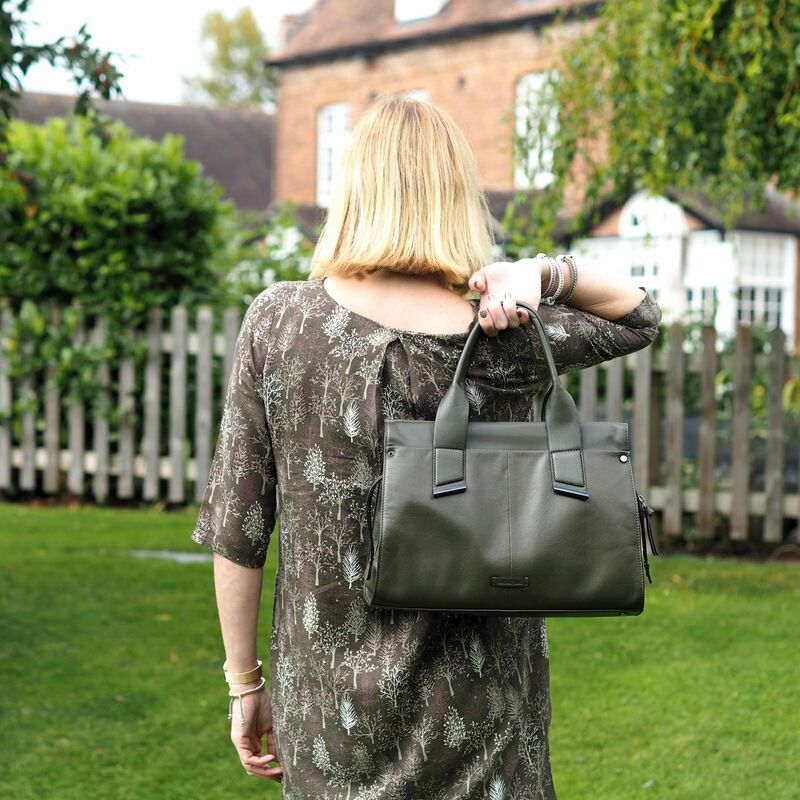 I adore khaki – it’s probably my wardrobe staple. I’ve got loads of things in that colour. Needless to say I therefore love the bag too. The dress (shape and print) is divine! SAME – My birthday is in October and autumn is my favorite time of the year. The clothes are just the best, and I think it has so much to do with texture. I’ve been eyeing a good bag since I switched over to backpacks and your bag looks absolutely wonderful and cute!!! I love the size, look and colour of it!